We are an established Powered Access Supplier with over 20 years experience. Specialists in our field we can help you find the right machine for the job. From only three UK depots and 270 machines, we have expanded to 21 locations and now have a fleet of more than 6,000 powered access machines. We have built a strong reputation in the market and have been involved in high profile projects such as at the Olympics London 2012, Goodwood Festival of Speed and on landmarks such as London Bridge and the O2 Arena. They will also be ale to advise you on damage waiver options, training and the supply of safety equipment to help you comply with Work at Height Regulations. In keeping with our motto – Friendly, Helpful and Professional - all our team members are Institute of Customer Service trained to deliver first class customer service. AFI-Uplift is part of the AFI group of companies and operates under the AFI Hire division. AFI Hire operates three brands, each giving their own unique solution to working at height. MEWPs and telehandler hire specialist covering England and Scotland. AFI-Uplift has been in operation since 1998. We have grown and expanded our operation by heavily investing in our fleet, people and systems. 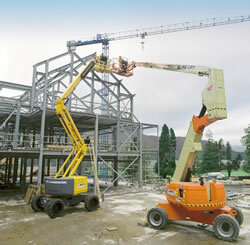 MEWPs and telehandler hire specialist covering Wales. In operation since 1990, AJ Rentals joined the AFI family in 2011 and helped us to increase our fleet and Welsh network with 500 MEWPs. Truck and track mounted hire specialist covering the UK. Operational since 2002, Wilson Access Hire joined the AFI family in 2013, bringing not only a vast amount of experience, but also a full range of truck and track mounted platforms to our fleet, helping our customers to reach heights of up to 57m.